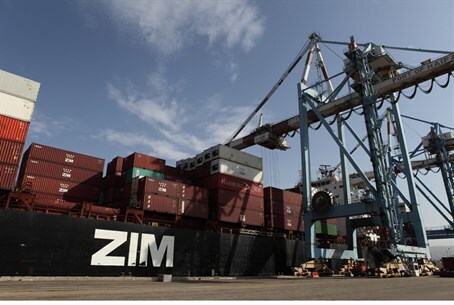 'Stop the ZIM' campaign claims Israeli shipping company 'funds the occupation' - even though it works with companies in Gaza, PA. Boycott, Divestment, and Sanctions (BDS) activists blocked an Israeli ship from docking at an Oakland, CA port on Saturday, as part of an anti-Semitic protest campaign to "Block the Boat" across the West coast of North America. Roughly 200 people held signs and shouted slogans at dock workers in Oakland's Shanghai port Saturday, according to Steve Zeltzer, of the "Stop Zim Action Committee." The ship was prevented from docking due to the protestors, as well as a heavy police presence at the scene. Organizers of the campaign claim that Zim - a Haifa-based Israeli shipping company - "funds the occupation of Palestine." The "Stop the ZIM" campaign has attempted to blockade Israeli goods in Seattle and Vancouver as well. A similar protest last month saw the Zim Piraeus leave for Los Angeles port with only a partial cargo, according to the Blaze. The company, despite leftist claims, actually works with both Gaza and the Palestinian Authority (PA) to transport goods, and has partnered with companies ELAWA for Shipping and Trading Company and Petra Navigation Co., respectively.